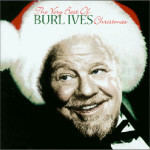 (MCA / Universal Records) A classic Christmas collection from the man who was the voice of Sam the Snowman in “Rudolph the Red-Nosed Reindeer”. Burl Ives looked like Santa and he brought the spirit of old St. Nick to life every holiday in our hearts when we watched “Rudolph the Red-Nosed Reindeer”. Selections include: A Holly Jolly Christmas, I Heard the Bells on Christmas Day, and Rudolph the Red Nosed Reindeer which were each penned by Johnny Marks.